We all know that we should exfoliate our skin. The age old scrub that we use to buff away the week behind us is the most common type of exfoliation, but is it the best for our skin? There are many types of exfoliators from chemical acids, enzymes, and cell activators such as retinol. So what’s the difference and how do they affect our skin? The scrub exfoliator we know and love is referred to as a mechanical exfoliator. The tiny abrasive beads scrape away dead skin and impurities on the skin’s surface. Facial scrubs leave us feeling fresh and squeaky clean but, some scrub exfoliators can be quite aggressive and even cause tiny micro tears in the skin, leading to spreading of bacteria and sensitivity. Be sure to use a good quality mechanical exfoliator with exfoliating beads that are spherical to ensure you don’t cause damage to your skin. 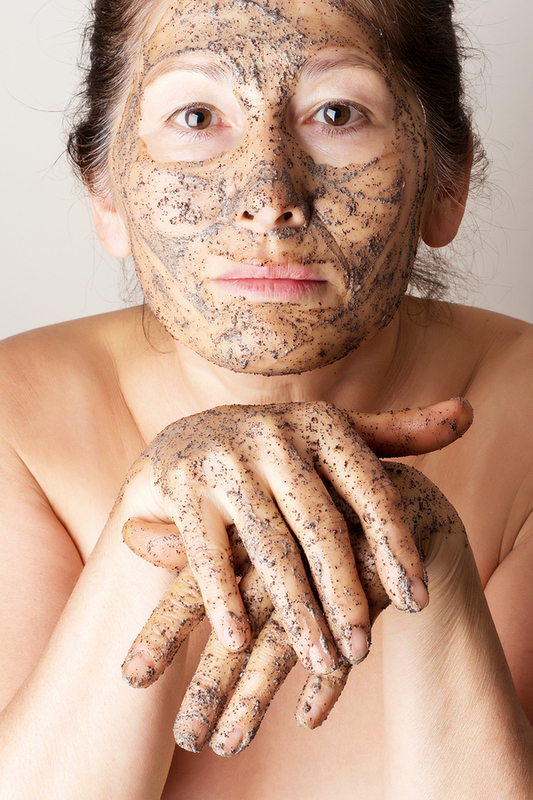 Avoid exfoliating scrubs if you have sensitive skin or very inflamed acne as it will be uncomfortable. For lower grades of acne and all skin types with open pores, the Clear Cell clarifying scrub is a gentle yet effective mechanical scrub that will leave your skin fresh and clear. Enzymes are found everywhere in nature, and have excellent exfoliating properties that will naturally dissolve dead skin. Remember the computer game PacMan? Imagine enzymes are a little PacMen that shuffle along the surface of your skin eating impurities. Botanical enzymes such pumpkin pulp, papaya, pineapple and mango have amazing revitalizing, brightening and hydrating properties, as well as being effective exfoliators. Good quality, cosmeceutical Enzyme exfoliators like the Vital C Hydrating enzyme Masque contain anti-oxidants, anti-inflammatory and hydrating ingredients too, so can be used by even sensitive skin types. Enzyme exfoliators are applied like a facemask and removed with water after 5 – 30 minutes. ‘Chemical Peels’ sound drastic, and even, a bit scary. The truth is the acids found in chemical exfoliators are all naturally derived and have been used in beauty remedies for centuries. The Ancient Egyptian women used to bathe in sour milk, which contains lactic acid and rejuvenated their skin. The Ancient Romans would exfoliate with grapes skins, which contained tartaric acid. Glycolic Acid is perhaps the most common. Glycolic acid comes from the sugar cane and works deeply in the layers of skin to dissolve the glue type bonds that keep dead skin cells attached to living, healthy cells. This has exceptional exfoliating results. It thoroughly removes excessive dead skin that can cause dryness, dull skin, increased appearance of wrinkles and blockages that can lead to spots. Because it removes so much surface skin, it triggers the body into replacing it with new skin. When this occurs regularly, the skin behaves like a younger skin, making new skin very regularly and repairing imperfections leading to dramatic anti-aging. As this new skin is made and pushes the old skin off, you may experience a little dryness and flaking as it peels away. This is normal, and, a good sign! Once the excessive dead skin has been removed, your skin will be functioning like a younger skin and the dryness and flaking won’t happen anymore, so push through it. Because chemical exfoliators are so effective, they can offer some side effects such as redness and tingling. YOU’RE NOT HAVING AN ALLERGIC REACTION! This activity in the skin is GOOD! The redness is blood that is increasing your circulation and feeding your skin, and the tingling means stimulation is happening. (This isn’t the case with all reactions, but buy your exfoliator from a reputable skin specialist who will ensure your reactions are good!) Ageless Total resurfacing Masque from IMAGE contains both micro-beads that gently buff the skin and a 17% blend of glycolic, lactic and salicylic acid (that targets oil on the skin) which work to deeply exfoliate excess layers of dead skin. It’s one of their best sellers due to it’s amazing lighting and brightening effects, perfect before a night out! Chemical exfoliators are applied as face mask and left to work for 2 – 10 minutes. Retinol is the name given to the entire molecule of vitamin A. It is a ‘Dermal Stimulator’ which means it kick starts the cells underneath your skin to boost cellular production. This can increase the rate at which new skin cells are made, pushing old dead skin off as they grow to the surface. Retinol is a powerful skin revitalizer and used in many serums as a leave on skin exfoliator. It’s not ideal for very sensitized skin due to it’s level of activity. When used regularly, retinol will rejuvenate, plump and hydrate the skin as well as shrinking pore size and evening skin pigmentation. This makes it a hero product for almost all skin types and concerns. To combine some or all of these exfoliation methods into your skin care routine at home would lead to fresher, brighter, and lighter skin long term. Enzymes will brighten your skin for and immediate ‘WOW’ effect whilst chemical acids work deeper down to revitalize your skin and retinol stimulates cellular function at the deepest layers, for total skin rejuvenation. All of these exfoliation methods are also available as in clinic treatments performed by a qualified skin specialist. To find your nearest IMAGE skin specialist and ask about which exfoliating method best suits YOUR skin, click here.